Rural Jasper County: 8:30am: Steve Fuller sees Dennis Grelk cross the highway and sends us a message to the effect that he is looking strong. <===Dennis Grelk in the final few meters of the event. Image courtesy of Wally Kilburg. David and I motored into the finish after Dennis had already left, but we made it back in time for Ek and Krause to come in second and third. <===Tim Ek raises his arms as he leads in Troy Krause to finish T.I.V7 with his second deuce finish in three years. .......a very spent looking Charlie Farrow pulled in to claim 4th place. Onlookers gathered around to hear the tales of the three finishers as they peeled mud stained layers of clothing off and tried to stretch muscles unused to standing after nearly 30 hours of bicycling. <===Charlie Farrow comes to a stop after 330 miles plus of gravel grinding. Although it wasn't at all planned this way, I sort of became a co-interviewer of the finishers as Jeff Fring was filming them giving their view of the event. Then most of them collapsed to the inviting green turf and shared a few quiet moments as onlookers stared at these road-worn men in silent disbelief mixed with a good amount of awe. <====John Gorrilla makes the final turn as his wife looks on. Then a while went by before John Gorilla pulled up over the little finishing rise and came in for a 5th place finish. While he said he was happy with his performance, and for completing an entire Trans Iowa, (John won a shortened T.I.V4), he was obviously disappointed with how things played out at the end. <====Sean Mailen rolls into a well deserved 6th place finish at T.I.V7 on Bliss Street. I know a lot of folks at Trans Iowa were pretty impressed by Sean, and if he comes back for more long gravel events, he'll be a marked man now. Sean spent a long time at the front of the event and only faded a bit in the final miles, or else he may have snicked off a few higher places than he did. Well, after Sean was interviewed, he retired to the grass as well. Then David and I knew it would be a bit before the next group of guys would come rolling in. We didn't think it would be almost two hours more though! <====L-R: John Williams, Eric Brunt, and Adam Boone finish T.I.V7 together. When John Williams pulled in, it was pretty cool to see his kids and wife greeting him. Eric Brunt was pretty chuffed to finish, and Adam Boone did it in his first try, as did John. Another thing to note was that Adam Boone won the "Industry Cup", becoming the first in that category to finish a Trans Iowa in the category's second year of inclusion in the event. Adam was representing Gu Energy, which was a sponsor of T.I.V7. <===Mike Johnson rolls in for a solo 10th place finish. About a half an hour later, in a surprise to David and I, Mike Johnson rolled in solo. We had come across Mike riding with three others earlier in the morning and had fully expected they would stay together to finish. Mike said he felt it was time for him to push on when the others were a bit hesitant for some reason and therefore he rolled on in solo. Single speed finishers, Aaron Gammel and Ben Shockey looked pretty good as they got off their bikes with Jonathan Weissman, who was another first time Trans Iowan that finished in his first attempt. It seems that if we get a full Trans Iowa in, we always get first timers that finish. Some folks don't do it after multiple tries, and some take a few years. Doesn't seem to be any rhyme or reason to that. Just something I've noted over the years. <==A smiling Corey Godfrey rolls in after quite the adventure! Well, I guess we really need to point out something extraordinary here. Given the circumstances, (a blown rear derailleur and tweaked frame), most of us would pack it in, and I know no one would even think twice about that decision. However; that isn't how Cornbread rolls. He went back to Grinnell, got fixed up to single speed, and hit the road in search of Trans Iowa riders to have an adventure with. After over 310 miles, I'd say that smile on his face tells the story. A good job of taking a bad situation and turning into something awesome. Time was running short. Who else would cross the line at T.I.V7? <====Charles Parsons, Jeremy Fry, and Joe Mann get in with 45 minutes to spare. Wow! Three more guys pull it off. Charles Parsons, Jeremy Fry, and first time finisher, Joe Mann make it into the final turn. We talk with each of them briefly, but the thing on our minds was, "Would Janna Vavre become our first Women's Open finisher?" Time was running out. The cut off for the event was 2pm, and as the minutes ticked away, we were starting to wonder if it would happen. Then at about 1:43 pm we saw some riders. The final two finishers of Trans Iowa V7, and sure enough, one of them was Janna. <===Janna Vavre is congratulated by Troy Krause upon her finish at T.I.V7. Scott Bigelow, in the background, also finished in his first attempt. It meant a lot for us to finally have a woman finish Trans Iowa. I am not sure exactly why we wanted to see that happen so badly. I guess there are several reasons, but no matter. Congratulations to Janna. She can always say she was the first, and no one can take that away from her. I asked her what she thought about Trans Iowa, and she replied that she didn't care to ever see a B Road again! Yeah, well maybe a wet B Road, I could agree with that one! Janna and Scott were the last two possible riders that could have finished, as all the others had pulled the plug already. It was 2:00pm, and Trans Iowa V7 was over. David and I left the finish line area to go fetch my truck, since he needed to get back home. I filed a final audio report, and I pointed "The Truck With No Name" northward to go home and see my family. T.I.V7 as an event was over, but I wasn't done with T.I.V7. Not by a long shot. I'll close out my rambling about T.I.V7 tomorrow with a final post containing my afterthoughts on the event. Checkpoint #2: 6:40pm : We had gotten word from some folks that the leaders were stopped in Norway, Iowa at a convenience store getting food and water. We weren't far from there and we knew it wouldn't be long before we had our first glimpse of Trans Iowa riders since Checkpoint #1, 10 hours earlier. We patiently waited as Jeff Fring set up his camera in the ditch where he would have a low angle viewpoint of the rider's arrival. Soon enough, here came two riders abreast over the small rise in the road. To my surprise, it wasn't exactly the pair I thought it might be. Sure, John Gorrilla was there, but his companion, Sean Mailen, was somewhat of a surprise to us. we hadn't seen, nor heard his name all morning. Of course, it was a matter of "flying under the radar", not that he couldn't be there, or that he didn't have the ability. Certainly, we knew he was a strong rider from last year's attempt at T.I.V6. It was also entirely possible he could have had a mechanical, like Corey, "Cornbread" Godfrey did, or that he had an injury flare up, like Lance Andre. Great riders entirely capable of winning a Trans Iowa that had misfortune visit that day. So seeing Sean's smiling face at Checkpoint #2 was a pleasant surprise, nothing more, nothing less. John joked with us saying, "Well, I'd like to see what you think a lot of B Roads are! 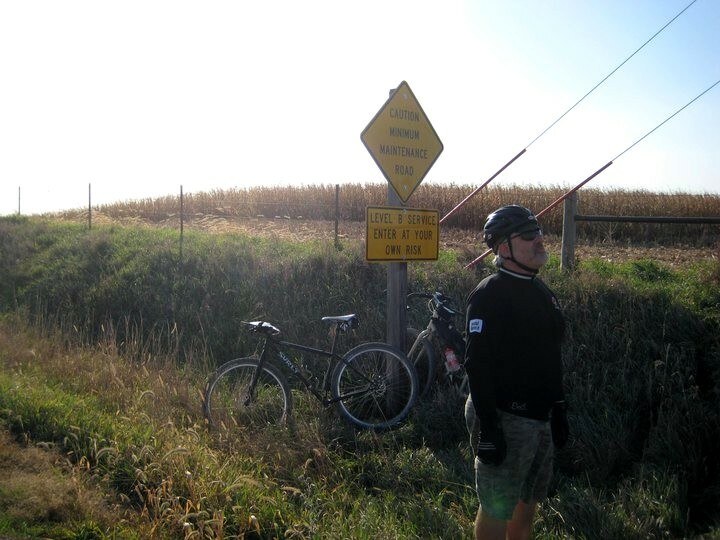 ", in reference to my comments before Trans Iowa that there were only a "few B Roads" between Checkpoint #1 and #2. Well, there turned out to be more than "a few", but that due to an auto-routing error that put us off our intended course by printing off different cues. Technology. Not all that reliable yet! <===Charlie Farrow (left), and Tim Ek, (right), were all business at the checkpoint. It wasn't long before Gorrilla and Mailen were off again, and then on their heels pulls up Ek and Farrow. Unlike the smiling, relaxed pair in before them, Ek and Farrow were graven, serious, and said little while they grabbed cues and prepared to give chase to the leaders up the road. That was the cue for David and I to head out to check on the course. We discovered another bridge out, and re-routed that corner a mile north. Then onward to see "S Avenue", which we knew might be a bit sketchy. We took a look at the steeply sloping downhill B Road, and deemed it okay for travel, then moved on. Night was falling, and soon our second stint of darkness would be upon us. There wasn't much to say about the next hour or so. David and I chatted in the car as we navigated by the cues. Everything was falling into place until we reached Belle Plaine. Southern Benton County is very confusing to navigate. The roads which should make sense in a grid system are twisted out of their East-West, North-South ways by hills, rivers, and ravines. Roads meet at obtuse angles and compass points can be hard to keep straight. David and I have been snookered several times riding our bicycles in this area. Even Joe Meiser, the winner of T.I.V5, was confused in this area, as it was the place where he made his infamous 4am phone call for directions to me. So, we get to a sign that says 11th something-or-another, and we were to turn left. Now, mind you, we weren't checking mileage at all. Why? Because the signs have more influence than the mileages do, or so it seems, so we were trying to keep it as "real" as we could, in terms of navigation. So, we get into Belle Plaine, and nothing makes any sense at all! We ended up finding the street we were to come in on, and back tracked it out of town to the corner where we should have turned left. Well! Whaddya know! It says 11th something-or-another as well! One was an "avenue", one was a "street trail". Wow. How goofy is that? David and I marked the corner where we went wrong to show you should go straight through, then headed into town to grab a bite to eat. It was nice since David suggested we go in and have a "sit down dinner". It was a great way to re-charge our batteries for the remainder of the night. Once we had eaten, we hit the streets of Belle Plaine, and we didn't get far before we hit another snag in the signing of the streets. Once again, wonky signage made our brains go awry. We had a devil of a time finding the correct street out, and when we did, it was found to have three different signs/names in the span of about six blocks. Ridiculous! So, we staked out some markers in hopes that the riders would see our suggestions on how to follow the cues out of town. <===Jeremy Fry heads out into the dank blackness. Image by Wally Kilburg. After that, the cues made sense and we were good to go. The turns were still requiring all the mind power a sleep deprived mind could muster though, and we would stop sometimes and have to work through things that were simple when our minds were fresh. It doesn't at all surprise me that riders get confused, disoriented, and second guess everything at every turn. We went through it all as well. It is part of the challenge of the event. Certainly we could tweak things out better, and I was already making plans as we drove the course to do just that. At any rate, we drove on. I have to say that northern Mahaska County has the weirdest signs on the roads I've seen. Instead of being on the corners, they were about 20-50 yards down the south bound road, and on a pole about two stories high! I think it was because we were driving on the East/West county border, but still......that was bizarre! <===Morning on Sunday the 24th. So, we ended up giving up finding the route at about 4:00am and went and slept in Grinnell for a couple of hours. Then we were back at it, driving the course backward after a getting word that riders were getting lost. This was a concern, so we drove backward down the course to find everyone we knew was still going. The first rider we saw was again a surprise. We were sure we'd see John Gorrilla up front, but here was Dennis Grelk! Did we miss the leaders when we stopped for gas in Montezuma? Maybe we did. We kept rolling as we wondered what was up. Then another lone rider. It was Gorrilla! Huh.....maybe Dennis was winning Trans Iowa! We got excited even more as we cam across Ek, Farrow, Krause, and trailing behind, Sean Mailen. Yes, Dennis Grelk was winning Trans Iowa V7! Meanwhile, we had to keep looking for riders. It wasn't long before we came across three's and four's of riders heading west under a bright, sunlit sky. These were for the most part all going to be finishers, since they were well within striking distance of getting to Grinnell before 2pm. Some were even taking rests, so we stopped to chat and see how they were. As it turned out, mostly good was the report we heard. Nothing too unusual and the riders we spoke with all seemed to be in great spirits. We still hadn't caught up with everyone, so we pressed on. <===The last B Road on course, and we actually drove through it! Still coming across a few riders, David and I were anxiously looking for the last women out on course. We heard the night before, after Checkpoint #2 closed, that two of the three women riding the event from Checkpoint #1 were quitting. That left Janna Vavre, who was from the Lincoln, Nebraska area. We knew that several Lincoln folks had gone through Checkpoint #2 with her, so we were hoping experienced T.I. riders were there riding her in. In fact, we had word from the riders we were running across that they had seen her, or had been in the group with her in the night. <===Corey "Cornbread" Godfrey was still out on his rig to see the rest of the route after the early mechanical put him out of the race. Well, eventually we did see Janna and another Cycle Works clad rider, (Scott Bigelow), coming down the road just east of North English. Cool! Then we found our remaining two riders in North English. Mission accomplished. Everyone we knew that was still riding, present and accounted for, and still on the route. Convenience Store, Garwin, Iowa: 11:30am: We had been checking out the crazy B Road on 270th in Tama County, then we left there to go onward, but we needed a stop for some munchies. I found Garwin, Iowa's convenience store a few years back when out riding recon for the Guitar Ted Death Ride Invitational. I stopped in to see if it might make a suitable stop for that event. Well, the lady at the counter, who was middle aged, was wearing a washer-worn, faded Guns N Roses t-shirt. I remember thinking it was sort of odd. Then, two weeks later on the GTDRI, we stopped, and we found the same lady with the same t-shirt on. Wow! That was fantastic! Only a couple of weeks prior to T.I.V7 I got to check back in, and the character working the counter, a big fella with a trucker cap, ripped sleeve t-shirt, and hairy arms all tatted up, made the stop amusing again. So it was with great expectation that I walked in this place last Saturday. I was a bit let down by the low character factor, but David walked out with a pack of candy cigarettes! No way! I hadn't seen those in well over 30 years. The afternoon wore on. We were getting some information on some of the action out there. It seemed that the lead four were John Gorrilla, Tim Ek, Charlie Farrow, and an unknown fella. Hmm.....who could that be. It was fun to speculate on the possible identity of the person and on the race strategy. We knew a couple of lone chasers were behind these fellows, and one was Dennis Grelk. <====A flowering tree that caught my attention Saturday. We also knew that at least three of the five women that had started were still trying to make it back to Grinnell. We were silently rooting for them. Trans Iowa just hasn't seemed to work for the women, and we wanted that to change. Beyond this, we were just cruising along, checking out roads. <===Some of the B Roads were starting to shape up, but not enough for cyclists. The day was getting cloudy, chilly, and the wind wasn't going away. The hills were punctuated by straights of rolling countryside here and there. We crossed Highway 96, and just west of Traer, we had a section I dubbed the "Wolf Creek Walls". Traer went by, then a B Road, then on to Dysart. Here was another of the features of this year's course that I was particularly fond of. It was the "Old Creamery Trail", a converted rail bed that was a pretty rustic, cobbled together bike path which David and I had a few wonderful night rides on. This went on for 8 miles through Garrison. There it went right on to a grassy strip lined with landscaping bushes. It looked and felt as though you might be trespassing on private land, but we weren't. That isn't how we roll at Trans Iowa. <===Checkpoint #2 volunteers, Wally and George had probably the coolest little checkpoint stop ever in a Trans Iowa. Just south of Norway, Iowa, where the Iowa Baseball Hall Of Fame is, we chose a gravel and B Road intersection to serve as the spot for Checkpoint #2. The volunteers, Wally, George, and Joshua were all there. Wally and George had a primo Element with a tarp, generator, i-Pod stereo system, movies, and a freakin' generator to run it all with! There goes my idea of having it be primitive! Ha! It was awesome though, and Wally, George, and Joshua were joined by Jim Thill, who had not made it to Checkpoint #1 in time. We all had a great time telling stories, laughing, and freezing our butts off in the country for a few hours on Saturday afternoon. Later on, some of the Checkpoint #1 folks stopped by, and we had Jeff Fring, the videographer, show up as well. It was getting to be a bit of a problem with regards to cars! It wouldn't be long though until we were off again. Night time wasn't far away, and we wanted to stay ahead of the leaders once they got in. <====Checkpoint #1 volunteers and hangars on awaiting the arrival of riders. After the hiccups in the very beginning stages of the event, we went onward through the ever brightening day. as the roads became more visible, we could discern that the moisture was just enough to cause the first half inch of the road surface to be soupy. From this point and onward, the roads improved quickly, and were not an issue for the rest of the event. What was becoming an issue was the wind. The skies were blue, and the sun was bright. It was a great looking day, but as we stood in the streets of Baxter, the wind was biting and chilled us to the bone. The riders coming westward faced the full brunt of its force as they toiled up the steeps of Jasper County. At this point David and I were a bit baffled by the lateness of the first riders into the checkpoint. We had thought the first group would come in between 7-7:30am, but nothing happened as the time approached 8am. Many of us went up to a convenience store across town for some breakfast. The first food I had eaten all day. Eventually, our videographer for the event showed up. Jeff told us that he had witnessed a big mix up where riders had went up a B Road and were confused as to where to go. This was obviously a concern, as we hadn't put any B Roads in the first leg. This was obviously what had slowed them down. David and I then decided to drive the course backward to ascertain where the lead group might be at. We were hoping that they would be in before the 9:15 AM cut off time, and then we saw them. Just a few miles away from Baxter, where Phil Wood had retired, the riders with mud covered faces were streaming around a fast left hander towards us. We followed them for a bit, then scooted around to forewarn the checkpoint folks that they were upon them. We didn't stick around to watch, as we knew of another re-route from my drive in the day before that needed to be marked. Off we went towards Checkpoint #2, a long way away! <==The corner was marked, the wind was still blowing, and here come the clouds! The course went about 13 miles straight east from our re-route with the wind. David was expecting that the riders would be flying in this section. Certainly, the opportunity to bag some time was awaiting those with the legs and the next set of cue sheets. Unfortunately, many just missed making it, and their day was done. Still, 42 folks made it through to continue onward toward the next checkpoint which came at Mile 173 into the loop. That was over half of the 76 starters still in the event. Some were snake bitten by the derailment earlier up the B Road. Others were stymied by the 25mph constant blast out of the West in combination with the hills. Some faced mechanicals that ended their day. Up the road were the usual suspects. John Gorrilla leading a group of about 10 that included Tim Ek, Charlie Farrow, Sean Mailen, and Dennis Grelk, amongst others. It was David and my opinion that Gorrilla would push the pace until he had burned off those not able to hang on and then work with the smaller group that resulted. Who would that be? Who would be the last men in that group? An unusual amount of activity is taking place for this time of the night. As usual, I couldn't sleep. Happens like this before every Trans Iowa. So, David and I didn't even really need alarm clocks. He was the first to get up and start getting ready. <==Corey "Cornbread" Godfrey heading out to the start. I followed suit and when we emerged into the lobby, we saw all manner of bicycles, gear, and riders clacking around in their cycling shoes and kit. Did anyone sleep at all before this event? <===Riders gather in front of Bikes To You. We rolled on down to the start in front of "Bikes To You" downtown. The main topic of discussion, of course, was the weather. It was drippy, foggy, and cool. just like last year. Nervousness was high. The forecast called for the wind to pick up, and for partly cloudy skies. Nothing about rain, but you never know in Iowa. We got down to the start line at about 3:30am, so I was short on time to do any audio update. I got the chance to check out just a few bikes, but we had to get some details on the roll out set in place, so it was pretty much all business as the time wore on to our 4AM start. We had a couple of gals to help out by getting their cars to block Highway 6 as we crossed it. David pointed the Element in the right direction, and I called the riders up behind it for a few last minute reminders. These little talks often make me feel like I am being a bit "parental" with these guys and gals, but of course, I don't really want anyone to get hurt, so I suppose it is only natural that I might admonish them a bit sternly as they prepare to take off. Instead of tooting the Element's horn this time, I used the "horn" that I used at the Pre-race. A Salsa Woodchipper served to let everyone know that we were taking off. I just sounded a call on it, and off we went! Trans Iowa V7 was really happening. <===The Wittemburg Grange reflects the first glow of dawn's light. It wasn't long before the elation of the start was wiped away though. We weren't very far into the event when we found a bridge out. A re-route! We snapped into action, and decided to go a mile north, then west, and a mile south to avoid the road in question. Pounding in stakes and making streamers wasn't too tough, but the riders were flying, and they were upon us at the third corner we marked. Off we flew, just avoiding being swallowed by the on-coming pack. Their combined LED light output looked like a freight train light shining up the road in front of them. Just then, we got a call from Steve, our photographer who was up the course. He said something "weird" was going on, and mentioned a County Sheriff's car, and some wandering soul that was being taken into custody. What the heck! Was this event doomed to disaster before we got 20 miles in? <===The sun shows first light on the eastern horizon through our spattered windscreen. We found out later that Steve rolled up to his chosen spot on course to find a lonely soul standing in the dark in the middle of the road. As if this wasn't alarming enough, the fellow wanted his car towed out of the snow up the road. Not an unusual request two months ago, but we haven't had any snow for weeks! Well, after a few anxious moments, Steve noted a very bright pair of lights approaching him. These were attached to a Sheriff's car. They frisked the guy down, and Steve mentioned that he had a lot of pills in his pockets. Apparently, this fellow had been going up and down the road, bothering farm houses, and generally being a nuisance since midnight. With that bit of weirdness behind us, and the re-routes done, David and I moved on towards Checkpoint #1, in Baxter, Iowa. Friday, April 22nd: I get everything loaded up into the "Truck With No Name". It had been spritzing moisture all morning, but as of load up time Friday, it had stopped. I figured I could make it without my impromptu tarp, which I stashed behind the seat in the cab. Meanwhile, I am dealing with stress over the last minute-ness of some of the T.I.V7 details and trying to remember everything I needed to bring before I left for Grinnell. I get into the truck, and what do you know? It started pouring rain. Gah! Out comes the tarp, and I scurry to get it secured well enough to deal with 60mph driving. Was this going to end up like last year? Crap! It sure looked that way. If the roads were already soupy, we were in for a short weekend! The plan was to scout some roads on the way down, hook up with David, and then get the Pre-Race Meat-Up underway. I saw the roads, and as I drove, I got more and more stoked about the event. They were actually in really decent shape. Some places were as good as it gets. David finally called me and said similar things about what he had seen of the roads so far. The only bummer? I found a B Road that had been converted to a C Road and gated over the winter, which meant a re-route. Luckily for us, (and really lucky for us, as we will see later),I had plenty of re-routing supplies on board the truck. As I got into town, I drove by the finish line area, and the road out of town. Everything looked primo! I met up with David at our motel, and we headed over to the venue for the meeting along with several racers who wanted to help out. The Trans Iowa veteran racer, if nothing else, can tote a box with the best of 'em! Thanks one and all for your extra hands! We even had them stuffing our bags and getting things done for us was much easier because of their help. "Super-Chamber-woman", Sheryl Parmely was awesome, as usual. Always helpful and right there when we need her. In fact, she lobbied very hard for a discount on our meals at the Steakhouse. Yes- everyone's meals were subsidized. Amazing! Thanks to the Grinnell Chamber of Commerce! Thanks Sheryl! We got a check in procedure started and riders were already standing in line to get signed on before 5pm. Thanks for being punctual guys and gals! Yes, we signed on our largest field of Women's Open riders ever with five and the largest Rookie Class ever with 37 riders. In all, 76 riders showed up and started Saturday morning, also a record. Trans Iowa V7 was already making history, and it hadn't even started yet! The Grinnell Steakhouse then turned into the "Grinnell Smokehouse"! So many folks were grillin', the place smoked up in a hurry. Doors were flung open in an attempt to alleviate the situation, which worked out rather well, in the end. Food was consumed, conversations had, and old and new friends met. Good stuff all around. Meanwhile, the video/documentary project was being worked on by Jeff Fring. He had already sat me down for a half an hour interview, and was getting more beta at the pre-race. Steve Fuller, our still photography man, was clicking off a few images as well. Checkpoint volunteers were on hand, and everything seemed to work quite well at the Meat-Up. Now, would the event go as well? Would the drizzle, which had finally ceased to fall, stay away? This and more in part Two of the T.I.V7 Race Report. Trans Iowa History Is Made!! Janna Vavra Becomes The First Female Finisher Of Trans Iowa! Sunday with about 10 minutes to spare before the final cut off at 2pm, Janna Vavra crossed the finish line of T.I.V7 in Grinnell, Ia. While Trans Iowa has always had women in each of the seven versions, this one is the first to feature a women finisher. Janna was one of five women starters and was quick to compliment her competition by saying that they should serve to inspire other women to stretch themselves to reach for bigger challenges like they have. Congratulations to Janna Vavra and all the women who toed the line at Trans Iowa V7! Trans Iowa V7's new overall champion, Dennis Grelk, was in the front of the event most of the 322 miles and finished with a time of 28 hours and 40 minutes. Dennis took advantage of an opening late in the event as he surged to the front and never looked back, crossing the line well ahead of second and third palce finishers, Tim Ek and Troy Krause. Single Speed/Fixed class featured two finishers this year with same times. They were Aaron Gammel and Ben Shockey. A "Special Achievement Award" goes out to Corey "Cornbread" Godfrey, who after detonating his derailleur and chain, went back to Grinnell, got it converted to a single speed at "Bikes To you", went back out and joined in on the ride, finishing out the loop, just for fun. Corey figures he put in a little over 310 miles. More detailed reports are coming throughout the week. Stay tuned!! Trans Iowa V7: It Is Time! Today it all kicks off. Trans Iowa will hold its Pre-Race Meat-Up at the Grinnell Steakhouse at 5pm sharp. Keep in mind that you need to get there as soon as possible after 5pm to get ta grillin'! That way, we can get to the meeting sooner, and get you to your beds sooner, because you'll need to get up at "dark-thirty" to toe the line for the start of T.I.V7 at 4am. But don't even think about coming after 6pm to the Pre-Race. Be on time folks! Now that the event is nigh, the only thing that we can do is see what the weather does. If it rains even a moderate amount, I fear it will become a quagmire, but with two days of drying out time before today, it still should be doable. We'll see. Trans Iowa Radio: Here's the deal on this. (I seem to cover this every year, and yet people still don't get it. Amazingly enough) At any rate, I do this for my own enjoyment. It isn't for a blow by blow account of your favorite rider, or your cousin, who happens to be in T.I.V7, or a service to keep nervous gals appraised of their man-friend's every position in the midst of the night. So, just what is it for? Well, some folks want to listen to me ramble on about the front group in the race, the conditions, and odd tidbits of whatever enters my mind after double digit hours of sleep deprivation. Other than this, it isn't really worth listening to. You could follow my Tweets @guitarted1961 with the #tiv7 hashtag too. Which, by the way, will appear in the right margin on this blog as well. But after it is all said and done, I sure hope no one gets all up in arms that these weren't on the T.I. site, or that I didn't mention "so-and-so", or that something didn't come out right. Because if you stop to think about it, you are just getting what you paid for. Know what I mean? And I may just be too busy to post anything, just so you know that going in. "They" have said a lot of interesting things about Brooks saddles over my cycling career as a mechanic. They? Yeah......you know. Those crazies that love their leather Brooks Saddles. The ones that swear by their comfort, and move the same, deformed, crusty saddle from the old bike to the shiny new one, because "they" would never give up their Brooks. Never! These are the saddles that have been crafted in England in the same manner since my Great Grand Dad was alive. (In Scotland!) Yeah.......and they haven't changed a thing since. In fact, it is said that these saddles are perhaps the longest running product ever produced without a significant change in the history of mankind. That's pretty crazy. Not only that, but it is also pretty crazy to see and feel your first new Brooks saddle. I will tell you in no uncertain terms that I thought the collective "they" that were singing the praises of these leather, steel, and copper contraptions were goofy. Maybe even conspiratorial. There seemed to be too much camaraderie amongst the Brooks followers. Suspiciously so. Hmm.....And those saddles, yes....let's get back to that. They were silly hard! The word "comfortable" seemed the furthest thing from my mind when I saw one of these things. Well, anyway, the Wrights was in great shape and I figured, "Why not try it?" I was looking for a long distance, comfortable gravel grinding saddle, and this Wrights was gotten for next to nothing, so I figured I would try it, and also see if the leather saddle folks were on to something, or not. I rode it on the longest ride I've ever done in one day. 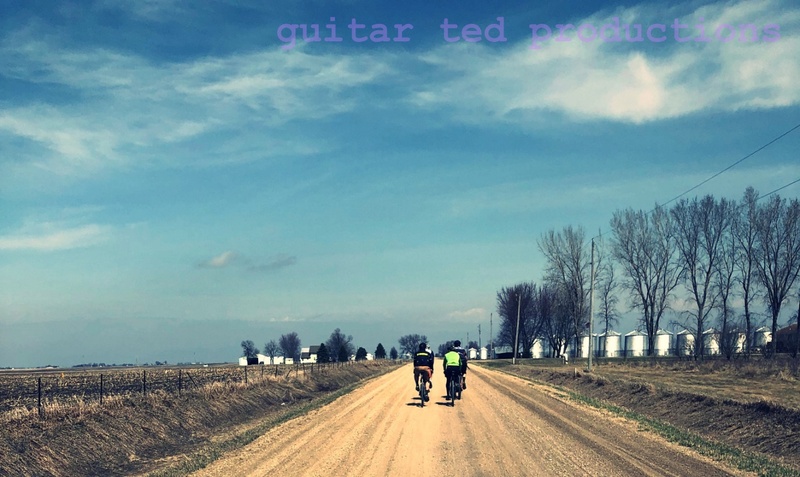 It was a Guitar Ted Death Ride Invitational, and I rode over 160 miles. The idea of a nicer Brooks leather saddle was instilled in me that day, because the Wrights wasn't quite right. I didn't get a Brooks right away, but last year, I finally pulled the trigger on one. My Brooks started out as a Special edition Green B-17. I rode it a lot last year mounted on the Gryphon, and you know what? It wasn't at all uncomfortable. Not ever. I will only lodge one very minor complaint. That is, the "Special Green" has turned to a "Special Ripe Olive". Maybe "Greek Olive". I don't have a clue why it has gone "to the dark side", but it no longer really matches the rest of the Gryphon's green bits. I guess that is okay. I will say that it feels fantastic to ride on, and I have yet to have to tension it. So, I guess "they" were right after all. This saddle is pretty darn comfy, and it seems to be holding up really well, unlike two other leather saddles I have tried which didn't even come close to being as nice as this Brooks Saddle. I'm not planning on removing it from my Singular though, it is just perfect, right there where it is. Just like Brooks hasn't changed their techniques in well over a hundred years. Haven't needed to. Sometimes you learn something good. Even though looks can be deceiving, and first impressions may not be great. I'm glad I found out otherwise. 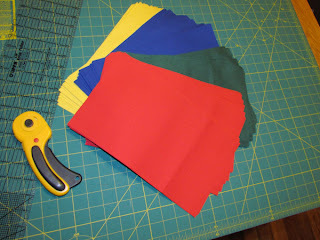 <===Material for "prayer flags" for T.I.V7 riders. Image courtesy of David Pals. With this crazy weather we've experienced over the past five days, our course conditions have gone from primo to crapola. But that could totally change in the next few days again. Who knows? All we can do is send up some prayers for better weather. And ya know what? I think we're going to get it. Speaking of prayers, I have to tell the story behind our "prayer flag" idea for T.I.V7. It came about while we were doing "bicycle recon" last fall. David showed me the spot he thought would make for a great "remote checkpoint", which was an idea I came up with to put a checkpoint in a place other than a convenience store. We actually were going to implement that for last year, but we never made it as far as Checkpoint #3. Oh well! So, the idea went to this year's course, and David had spied out this little intersection. <===The spot that inspired the flag idea. We were stopped walking around looking at how things might lay out. The car could go here, the guys could hang out here along this ditch embankment, and so on. Well, as I walked away to get back on my bike, I casually looked over to a utility pole that was guy wired to provide support in the constant Iowa wind. I thought about those pictures you see of Mount Everest expeditions, where Buddhist monks have tied their prayer flags to ropes and they fly ragged in the wind. Much like old seed corn bags and plastic wrap does from barbed wire fences in rural Iowa. I saw a kind of comparison there, and a tie in with the hopes and fears of Trans Iowa riders. "What if, instead of number plates, we gave the guys prayer flags", I said, not expecting any answer. Well, David was inspired, and he actually pursued the idea later, and e-mailed me his thoughts. Well, here ya go! David is doing this for T.I.V7, and I think it is pretty cool. So, you won't be getting a number plate for this years T.I. You'll get a "prayer flag". What you do with it afterward, well, that is up to you, if you are in the event. During the event, we'd like folks to tie it onto themselves, or their bike, and let it flap in the wind. We thought it would be cool if you had to pull out, if you would tie the flag to a fence, or a post, or a sign, to mark how far you made it. Or not. Maybe folks will want to keep these a long time. Maybe you'll blow yer nose in em and throw them out! We don't know. And barring any unforeseen calamity, these will be in your bags at T.I.V7 check in. I got a question on Twitter yesterday referring to Trans Iowa this coming weekend and the weather. As many of you Upper-Mid-Westerners know, it has gone from weeks of dry weather to wet in the last three to four days. That makes for soaked roads, and really muddy B Maintenance roads. Trans Iowa is a 320-ish mile, gravel road event, self supported, self navigated, and has two checkpoints, (this year), with time limits to reach each checkpoint and the finish. Every year is a different course. Every year the checkpoints are different. Time to get to checkpoints is determined by difficulty of each section, but is based off my formula of covering ten miles of course every hour. In other words, you just have to go fast enough to allow for stops, crossing roads, difficulties with weather and roads, that leaves you covering 10 miles every hour. Go fast, and you put "time in the bank" for things like resting, flats, head winds, or having to walk B Maintenance roads that are unrideable. Go slow, and you run the danger of not having time to stop, and possibly missing a time cut off. So, this year we are granting 34 hours total time. Checkpoint #1 will be at about 53miles and I have held close to the "10 miles of course covered in an hour" formula. But I have granted more time to get to the next checkpoint, and especially to the finish. Less than 10 miles every hour covered, in fact. In the grand scheme of riding, that's pretty slow. Granted, it is 300 plus miles, and the head winds are yet to be determined, along with the ride-ability of any of the B Road sections. So, it isn't like it will be easy, but it should still be do-able, even with damp, wet roads and unrideable B Roads. I think the answer is "yes". It can be done. But the weather will have the final say on that! Now for something completely non-Trans Iowa related! Some Musings On Sea Otter: The aftermath of Sea Otter has many in the cycling industry feeling maybe a bit euphoric. Many new introductions were filling the internet. As for 29"ers, it was a bumper crop for intros. In fact, it pretty much blew Interbike out of the water, and only Eurobike surpassed what has to be seen as a crazy good Sea Otter for 29"er freaks. 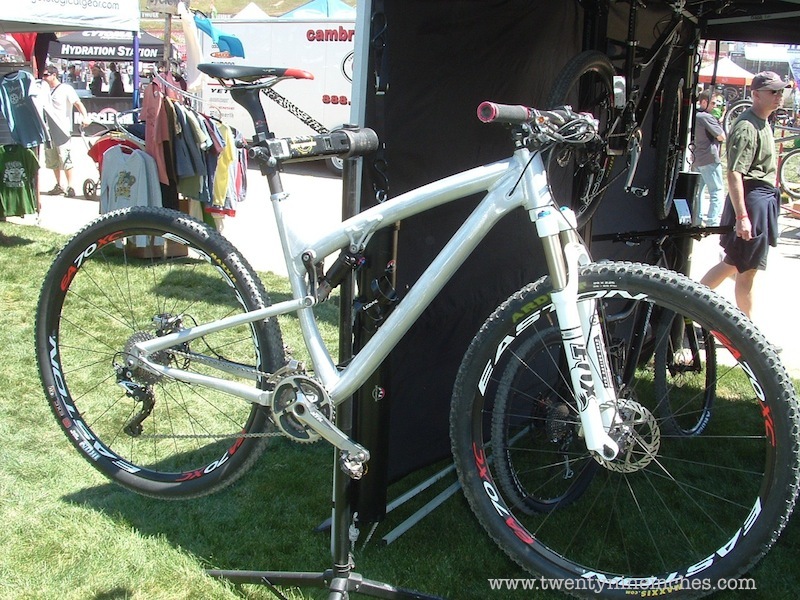 It was not just a few tires, but a lot of tires, more than a few wheels, many forks, and of course, lots of bicycles with 29"er wheels, like this stunning Rocky Mountain Element prototype I chose to post today. 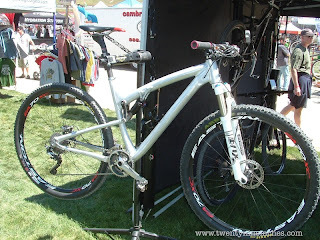 I have worked Sea Otter before, and in my short few years or so of covering it, this one had easily twice to three times the amount of big wheeled goodies to talk about. So, what does that say? I think a couple of obvious things. First- 29"ers are reaching another level of popularity with riders. Of course, Europe coming on to them a bit sure has helped. Oddly enough though, I still get e-mails from Europeans saying that it hasn't caught on yet, so I think there is a long ways to go there. Still, it is obvious that the industry believes that there is a larger potential market place for 29"ers than ever before. Secondly, it speaks to the ever increasing consumerism for bicycles. We see it at the shop where I work as well. Sales are up. Way up. Is it gas prices? You know what? I don't think so. For some reason, bicycles are just hot now, and 29"er bikes seem to be pretty hot as well, at least in North America. However it is, 29"er stuff is coming out at an ever increasing rate lately, and I sure am amazed to see what has happened since I got my first one in 2003. I Didn't Go, And I Was Still Busy! The Dirty Kanza 200 Chronicles: Stressed Out! Trans Iowa V7 Update #22: Remember The Following! Friday News And Views: AKA "I'm Not Gonna Do It!"